We have checked our remaining ice houses. One had no bats in. We usually find several here, but a new door has been put on it and the temperature inside the ice-house was a bit high at 8 degrees, which may or not have anything to do with the door. 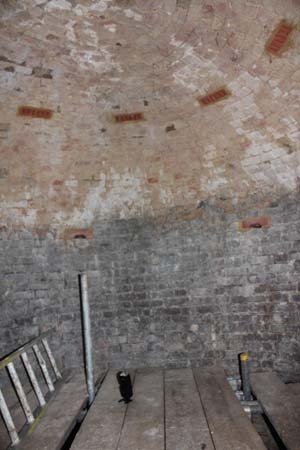 The second ice house has undergone refurbishment following a grant from the Heritage Lottery Fund. The Bat group were asked to give advice as to suitable mitigation for alterations being made. The builder and the architects have been really positive and the changes are impressive. A rather alarming lintel has been replaced, which makes the ice house much safer but removed some crevices which the bats were using. But the roof now holds 10 bat bricks for bats to lurk in. 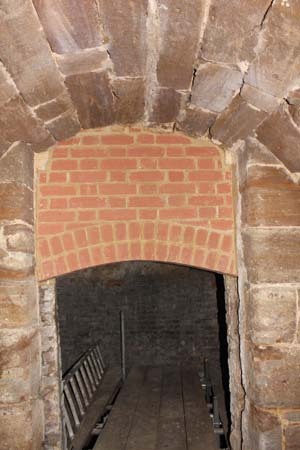 In addition they have build some bat bricks into the walls which allow bat to get into the cavity between the two layers of brick. This will make it practically impossible for us to spot them, but we don’t mind!. The builder who has done the work was at the site and came in while the ice house was checked. What was really nice was that despite the work which has been going on earlier in the season (before the bats moved in), a bat was found in a crevice. Evidence that there has been no serious disruption. We will be very interested to see what happens here in the future. This entry was posted in Uncategorized and tagged hibernation. Bookmark the permalink.